Pyramid E&C provides a single point Engineering, Procurement and Construction Solution for Hydrocarbon Processing facilities complete with utilities and infrastructure. Pyramid E&C also offers a range of production solutions suitable for quick deployment and operation on a single point responsibility basis. Most of these are pre engineered and modularised packages which can be shipped within a matter of weeks. Only the minimal site construction scope remains which can be managed by a small team or local contractors. Pyramid E&C has its own modular fabrication yard close to Mundra port in Gujarat, Western India. Due to its proximity to jetty, Pyramid E&C can ship large process equipment and modules weighing upto 800 tons to expedite projects. 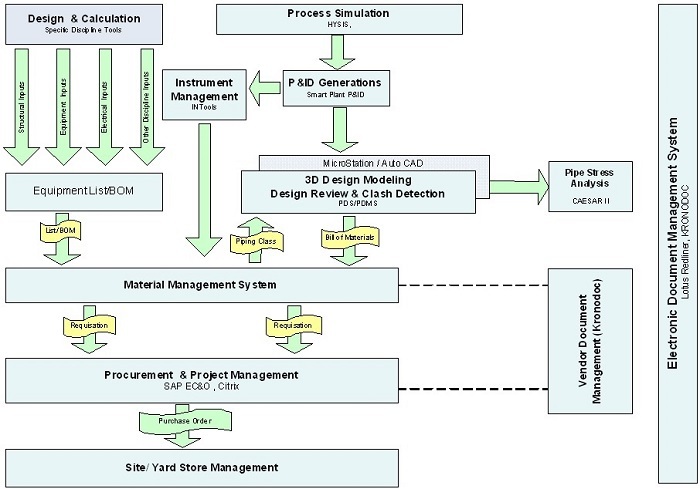 The key driver of EPC is the integrated management system shown below which enables mobilisation of thousands of personnel and myriad of material and services which go into a process plant.